The Complete Platinum Program includes practice exams, an unprecedented amount of course materials and interactive programs. 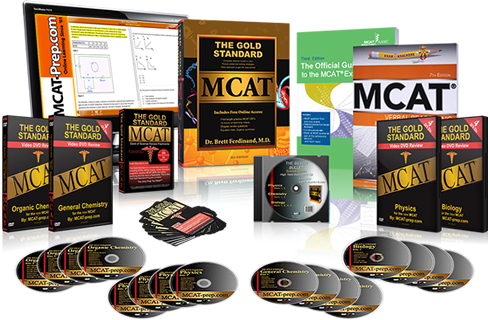 You will be given over 3000 questions, answers with explanations including more than 10 full-length practice tests, 8 corrected essays, 7 tests, 16 Video DVDs, audio MP3, complete MCAT review, etc. We will teach you test-taking strategies and sections containing online warm up exercises using question types you can expect on the actual practice MCAT exam. For the best in Online Courses, review and Computer Based Tests, from Verbal Reasoning to the Writing Sample or any of the test's sciences, click on one of the online courses below. MCAT Writing Sample is an online course for students who wish to improve their Writing Samples and have up to 8 of their own Writing Samples corrected and returned with specific comments. MCAT Organic Chemistry is an online course for students who want a complete multimedia review for Organic Chemistry including videos, interactive organic chemistry programs and live online teaching.